The Macaroni Lettiga Business Professional All-in-one travel luggage bag is elegantly designed to be the ideal companion for daily business usage as well as those demanding business travels to cart and protect most Netbooks and Notebooks with screen size from 13.3 up to a max 15.6” with enough space to carry items such files, documents and other multimedia essentials.This Trolley travel bag also features four flexible multi-directional spherical Spinner wheels for easy mobility that rolls upright so there is no weight on your arm or shoulder. 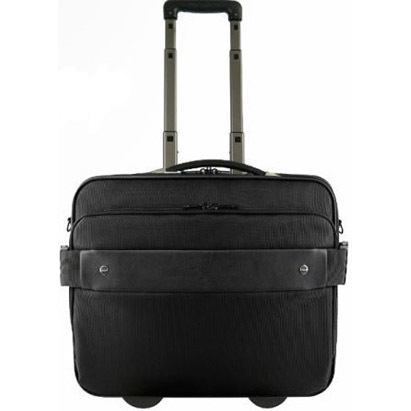 The lightweight and extremely durable Macaroni Lettiga Business Professional All-in-one travel luggage bag’s large section can also be used as a luggage travel bag to store a suit, couples of shirts plus a pair of shoes and other toiletries needed for business trips. 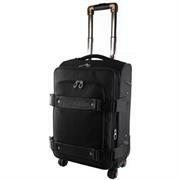 The four flexible spinning wheels each turn 360 degrees means this case goes where you go effortlessly. It also conforms to IATA regulation size for hand luggage, including most budget airlines-( We advise that you check with your airline before travelling) and allow easy movement and let you push it sideways down the aisle of an airplane. This is an ideal choice for most business travellers needing a good all–rounder trolley hand luggage bag that won’t let you down on your business trip. • Fits Notebooks with up to 15.6" screen size. • Front zipper pocket for your mobile phone, Passport , ID holder, Business cards Key clip, etc. • Conforms to IATA regulation size for hand luggage cabin luggage, including most budget airlines. 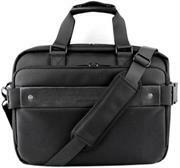 The Macaroni Manico 15" Business Professional All-in-one travel Trolley Laptop Case is elegantly designed to be the ideal companion for daily business usage as well as those demanding business travels to cart and protect most Netbooks and Notebooks with screen size from 13.3 up to a max 15” with enough space to carry items such files, documents and other multimedia essentials. The lightweight and extremely durable Macaroni Manico 15" Business Professional Trolley Laptop Case’s large section can also be used as an overnight bag to store clothing plus a pair of shoes and other toiletries for business trips and conforms to IATA regulation size for hand luggage, including most budget airlines-( We advise that you check with your airline before travelling).This is an ideal choice for most business travellers needing a good all–rounder trolley hand luggage bag that won’t let you down on your business trip. • Fits Notebooks with up to 15" screen size. • 4-tier telescopic locking handle that can be folded down when not in use. • Compartment for up to 15.6" laptops and multiple other sections with storage pockets. • Adjustable straps with buckles to keep files, documents or clothing secure. The Macaroni Caretto 17" laptop trolley backpack designed in Italy, successfully combines the requirements to cart and protect laptops up to 17” with enough space to carry items such files, documents and other multimedia essentials with an added feature of a trolley support system that allows you lug it around in comfort on the pack of wheels at the bottom. 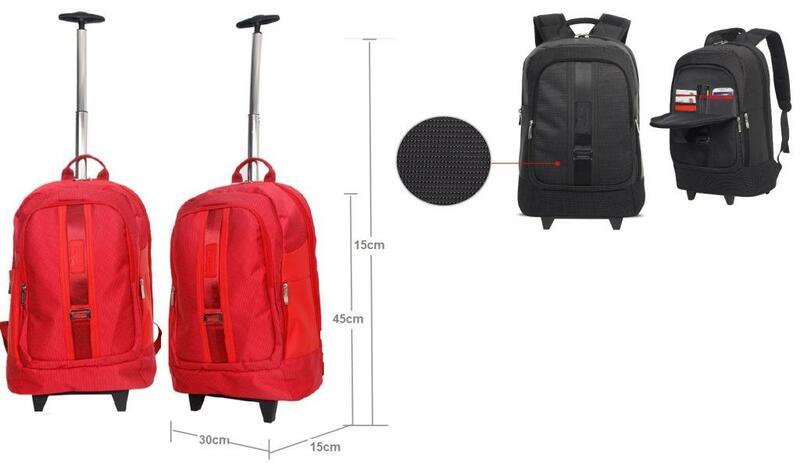 The lightweight and extremely durable Macaroni Caretto 17" laptop trolley backpack offers great protection to your laptop with the plush padded polyester lined notebook pouch and offers exceptional comfort with padding on the back mesh panel and on the ergonomic designed adjustable shoulder straps. The push button extendable handle monotube trolley feature allows you to pull out and push back the trolley with much ease, allowing you to lug around without having to carry it. This backpack provides both style and functionality that is specifically designed for the business traveller and commuters alike. • Expansive interior storage holds books, files and folders, documents and personal items. • Ergonomically designed and Shoulder straps. • Padded interior laptop pouch with scratch-resistant fabric protects almost all Notebooks and Laptops up to 17"
• Front zippered pocket provide organization with dedicated pockets for Smartphones, pens, sunglasses etc.